When is Day of the Dead in Mexico? Which Cemetery Should You Go to in Oaxaca? Should You Wear Skull Facepaint to the Graveyard? 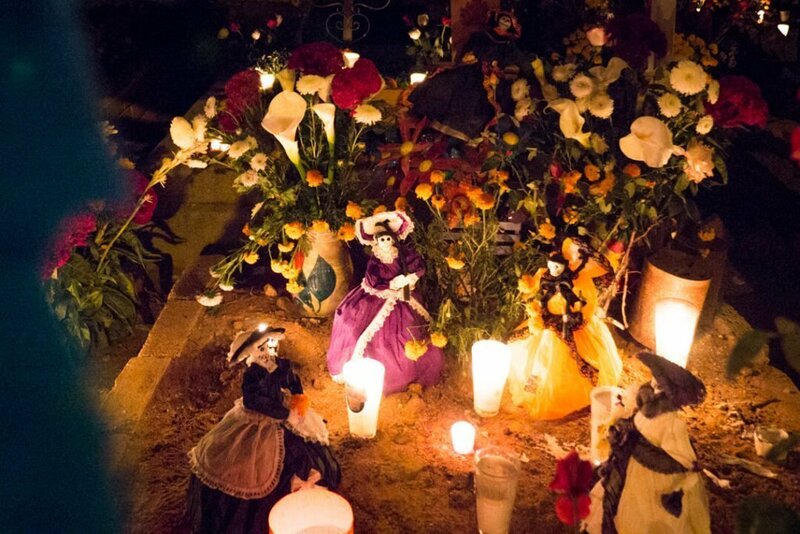 Are you going to be in Oaxaca for Day of the Dead this year? 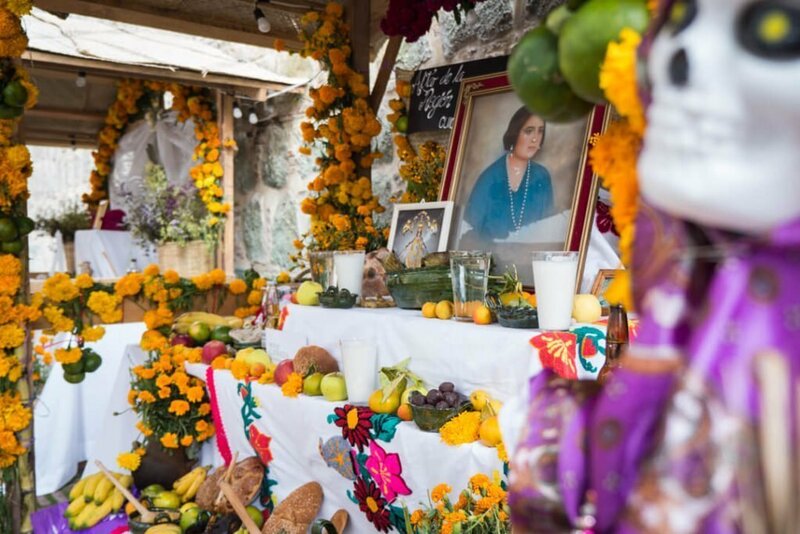 This complete guide will help you experience Day of the Dead, Oaxaca like a local. Day of the Dead (or Dia de Los Muertos in Spanish) is a dearly held tradition of Mexicos Aztec, Toltec, and other Nahua people for thousands of years. For these cultures, death was a natural phase in life’s long continuum and mourning the dead was disrespectful. The dead were still members of the community, alive in memory and spirit, and during Día de Los Muertos, they temporarily returned to Earth. For three days each year, it is believed that the veil between this world and the next is especially thin. During the Days of the Dead, it is believed that the spirits of the departed return to visit with and to provide counsel or give advice to family members and loved ones. It is necessary for the family to ensure a safe and easy return, and so the loved ones will provide this passage in the form of altars (or ofrendas). The altars also act as a form of enticement, guidance and sustenance for the spirits making the journey back to earth. The Day of the Dead date differs slightly all over Mexico, with some towns dedicating entire weeks or even months and other places do not really engage in it at all. 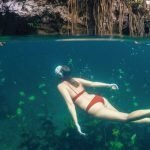 This is why it is important to research your chosen destination to make sure that not only do they participate in Day of the Dead, but that you as a tourist will also be welcome there. 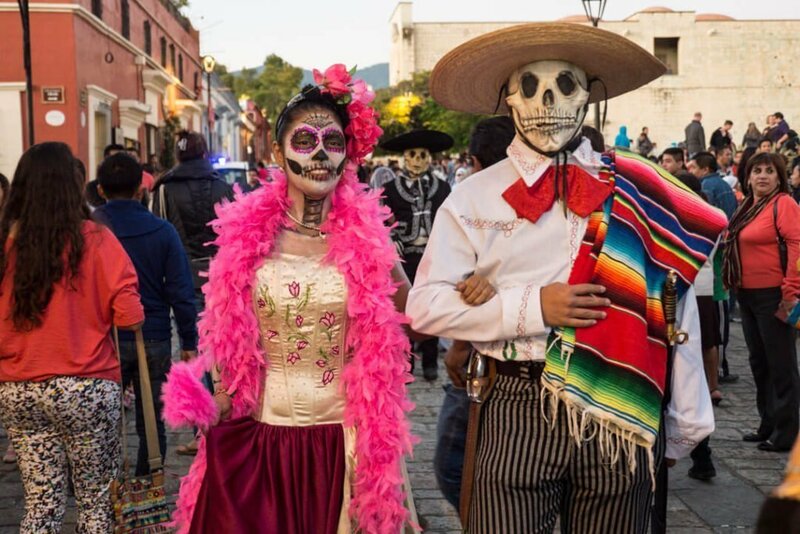 Oaxaca City celebrates Dia de Los Muertos across 3 days and nights, starting on October 31st until November 3rd, with the last night being on November 2nd. 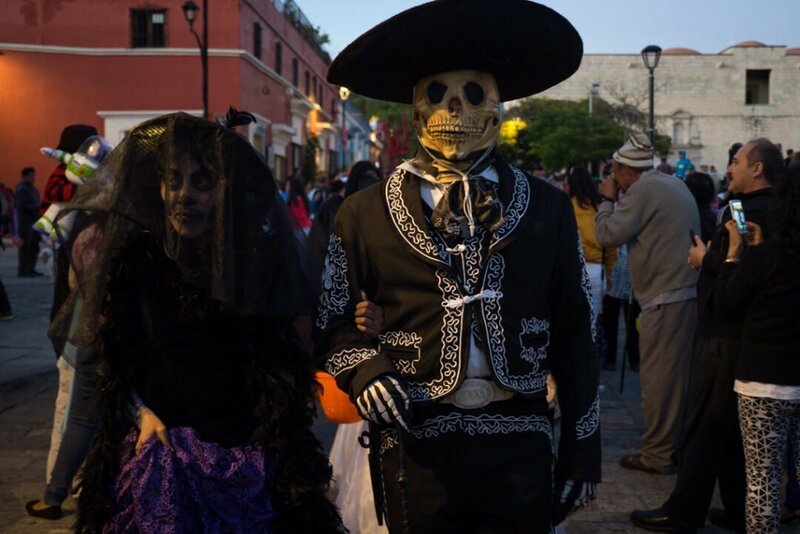 There are two types of celebrations a visitor to Mexico might choose to experience for the Day of the Dead, depending on where you go and what you decide to do. 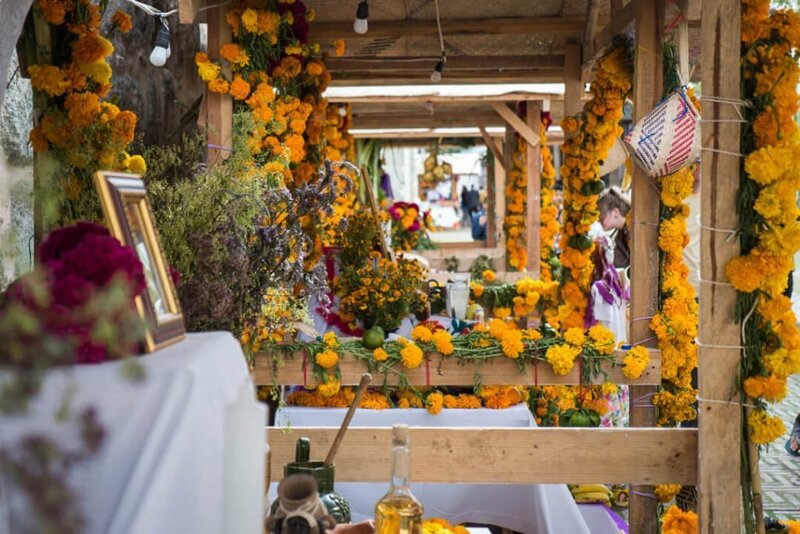 There is the traditional Day of the Dead, where entire families, extended families and friends spend the nights out of their homes and next to the grave of their loved ones, conducting a vigil to connect with the dead by singing, eating and drinking tequila. 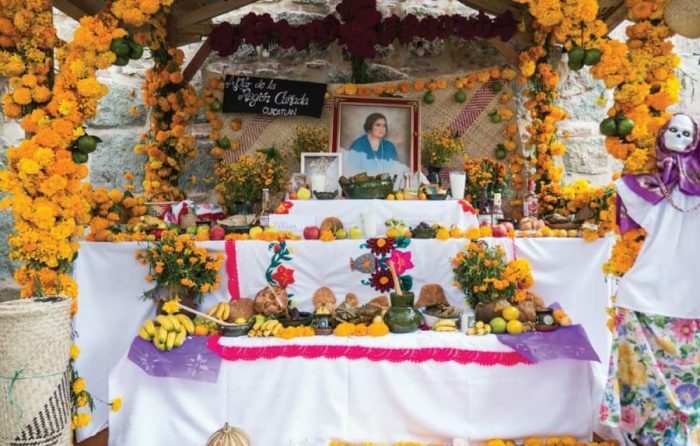 The graves have been cleaned and are intricately decorated and covered with bouquets of flowers, candles, and the favourite foods and drinks (usually alcoholic) of the deceased. Then, there is the newer way of celebrating Day of the Dead. This one consists of parades, sand art, kitsch-style makeup and skeleton costumes. The new way is not without its history, however. The skeleton woman you might associate with Dia de Los Muertos is called ‘La Catrina’ and she is an important icon of Mexico’s Day of the Dead history. There is no right or wrong way to celebrate Dia de Los Muertos, but it is important to know at least a little bit of its history. They spend it in a Graveyard. Surrounded by friends and family, often playing music, socialising and drinking. 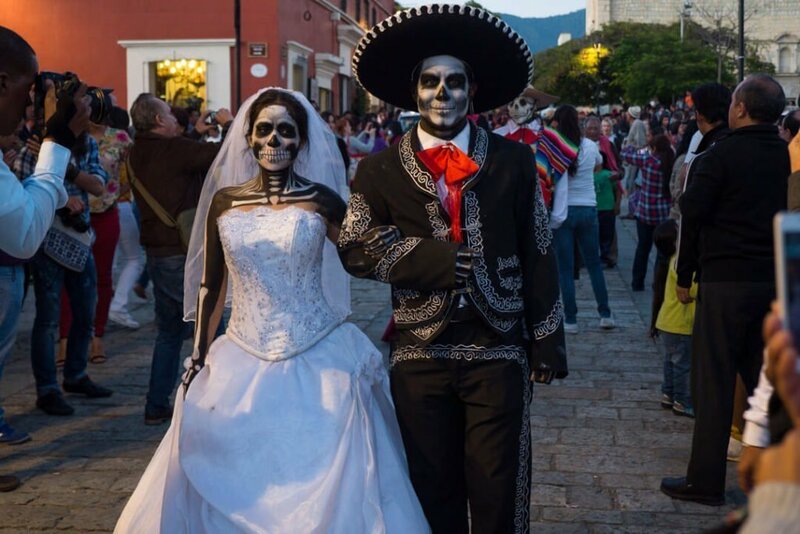 That huge Dia de Los Muertos festival you saw in James Bond’s ‘Spectre’ – that’s not REAL. That huge parade was made up for the movie and now parades and festivals have become somewhat expected by tourists. 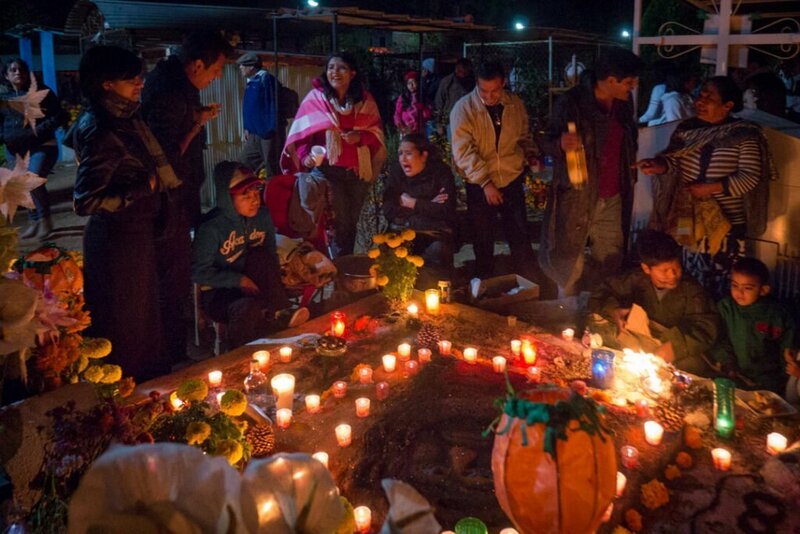 Though Oaxaca does put on parades (and they’re actually really great) traditionally the night is spent in the graveyard, alongside the resting place of their dear loved one. 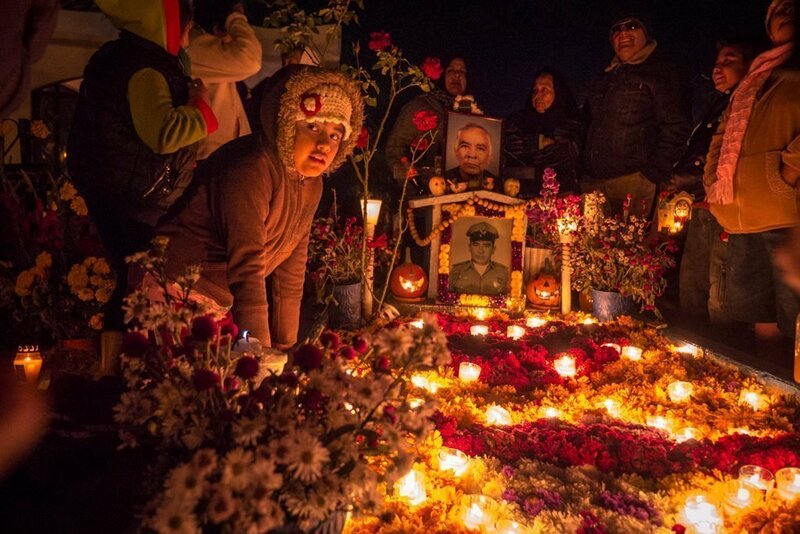 This to me, is what makes Day of the Dead intimate and so special. 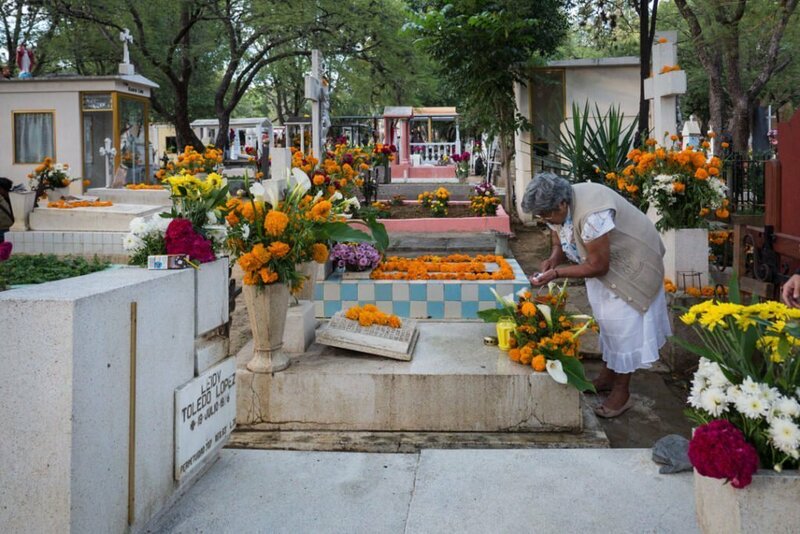 There are several cemeteries (panteones in Spanish) that are popular destinations for Day of the Dead. Also known as Panteon de San Miguel, this is the closest, largest and most beautiful graveyard in Oaxaca City. 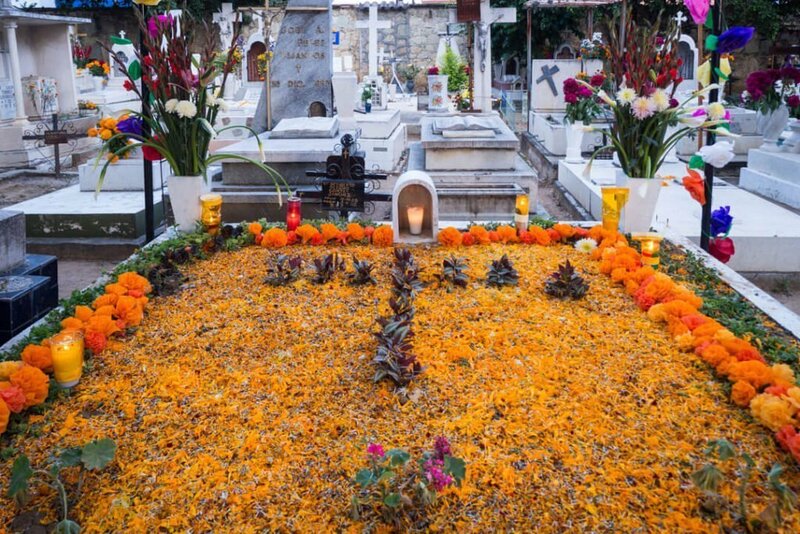 In the days leading up to Dia de Los Muertos, the graves and crypts are decorated with marigold flowers, petals and leaves, candles, foods and drinks. If you come here during the day, there’s a good chance you will be able to observe the families cleaning the grave and decorating it as part of their tradition. At night, the atmosphere becomes even more magical, as families sit by the graves, some playing guitar, some singing and others just eating and drinking. It is a night of remembrance and celebration that their loved ones will return home for the night. Panteon General is about a 20-minute walk from the Zocalo in central Oaxaca City. Visit here on any of the days or nights for Dia de Muertos to see the festivities in action. The small town just out of Oaxaca called Xoxocotlan, known to locals as Xoxo (pronounced “ho-ho”), is home to two cemeteries. There is Panteon Nuevo Xoxo (New Cemetary) and Panteon Viejo Xoxo (Old Cemetary). Xoxo is quite famous for its huge Day of the Dead night on October 31st. Some say that it’s “too touristy now” but the tradition can still be observed here and if you were trying to escape the tourists, you wouldn’t be travelling to Oaxaca for Day of the Dead. Xoxo Cemetary is about a 20-minute taxi ride from central Oaxaca. Since the celebrations are at night this is a cheap and easy way to get out there since public transport at these times is limited. 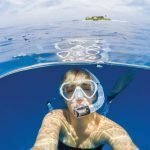 There are also tours but I think you will engage in a more authentic experience without them. There is a kind of different Day of the Dead that is held on November 1st from 10 pm in San Agustin Etla (about 50 minutes from Oaxaca City). This event is called a comparsa, and although there are comparsas in lots of different villages, Etla hosts one that is the most unique. There are lots of other villages with small, traditional graveyards you can visit. However, some aren’t open at night and others might celebrate on different nights. 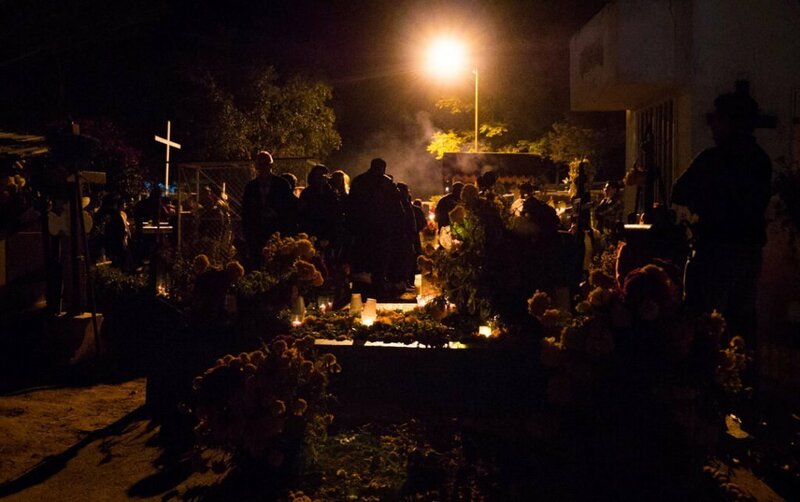 Check up the cemeteries at Atzompa, San Antonino, and San Felipe del Agua for ones that do Day of the Dead celebrations. 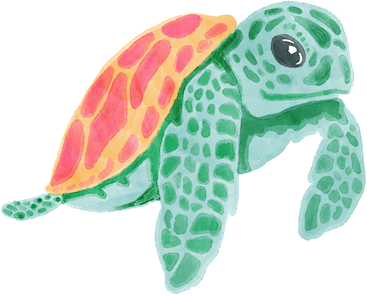 But, if you befriend any locals in Oaxaca ask for their advice on which ones to go to since there are so many! When you are at the graveyard, just smile and say hello to locals – even if it is in English. You’ll likely be invited to sit for a while and drink tequila or ponche (a spiced tea common during this time of year). You can even bring along snacks of your own, especially candy for the children (that’s a quick way to become popular). 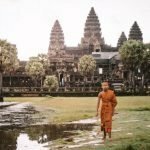 As with any type of cultural tourism, please keep in mind that you are a guest to this tradition. Do not act like a drunken jerk and ALWAYS ask permission before you get in someone’s face and take their photo, especially at such a sensitive time. 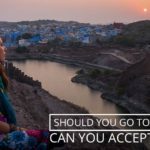 The short answer is; in Oaxaca you can. But, I wouldn’t recommend it. Generally, a local would not really wear the skull painted face to the grave and in some places, it would be even considered extremely rude to turn up to the graveyard with your face painted. However, because Oaxaca is quite a tourist destination for the Day of the Dead they are a lot more relaxed towards the face paint and costumes. While in Oaxaca for Day of the Dead, I was with some local people I had met on the Couchsurfing website. They took me to a party and then later that night we all went to Xoxo Cemetary together. I had my face painted at the party and didn’t think to wash it off before heading to the cemetery. I simply didn’t know any better and wasn’t informed. That being said, I did not encounter any hostility and I also saw young local children were also wearing face paint, so I felt accepted. I wouldn’t do it again, though. I highly recommend arriving at least a few days early. 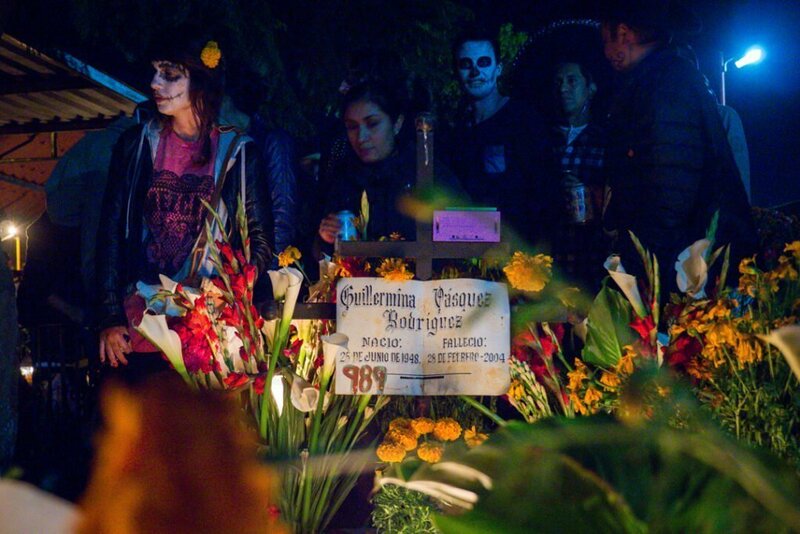 Day of the Dead is one of Oaxaca’s most notoriously busy tourist times. Arriving early will give you time to meander around exploring all of the altars, artwork and markets. 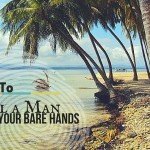 The following is a list of the best things to do in Oaxaca in the days leading up to and during Day of the Dead. Save this map of Oaxaca Day of the Dead Activities into your Phone or Google MyMaps by pressing the square button [ ]. You’re most definitely going to want to head to a local market in Oaxaca during Day of the Dead. 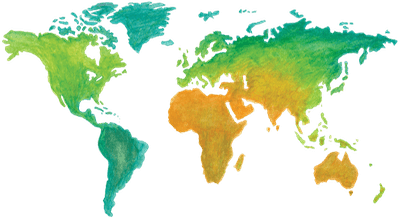 This is when the markets will light up and overflow with the bright orange of marigolds, the deep magenta of cockscomb buds and the fragile white of baby’s breath flowers. 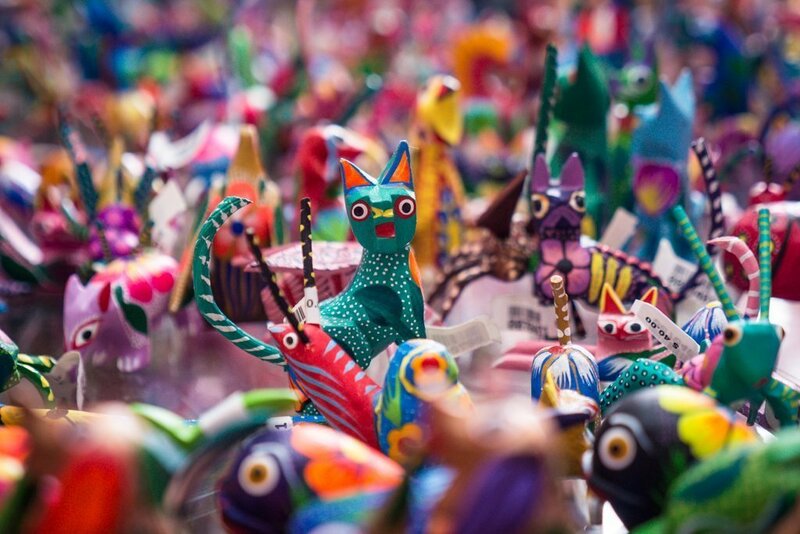 Not to mention all manner of kitschy skeleton figurines shoved alongside famous alebrijes (fantastical wooden creatures painted with bright intricate designs that are made by hand in Oaxaca). 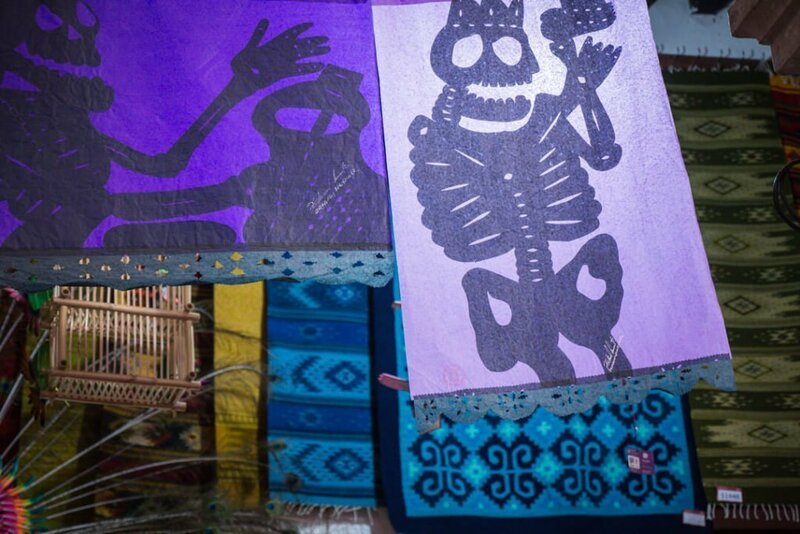 The best Market in Oaxaca for Day of the Dead wares is Central de Abastos. For food stuffs like Pan de Muerte (Bread of the Dead) and the little sugar skulls made with marzipan visit Mercado 20 de Noviembre. 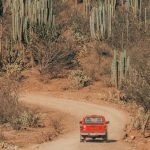 You could also consider heading out of Oaxaca to a market in one of the smaller villages for a less-touristy experience. Good village markets to visit around the Day of the Dead times are Ocotlan and Tlacolula. Most of this Calle Alcalá is a closed-off pedestrian street meaning walking here is usually a bit more chilled than on the tiny sidewalks of the rest of the city. But not during the Oaxacan Day of the Dead, when the street fills with tourists, vendors, artists and street performers. Shopfronts, bars and restaurants all decorate their windows and walls; artists spread their work over the pavement and giant paper-maché alebrijes jut out into oncoming traffic. Its magical and exciting, but make sure you veer off the path to explore other smaller historic buildings as you never know where you’ll see a Dia de Los Muertos altar. Oaxaca’s streets buzz with movement and excitement in the days of Dia de Muertos, with fiestas and parades called Calenda. Calenda is a street party with dancers, people dressed as La Catrina, music and huge puppets on stilts. There isn’t really a schedule for the parades but when I was there they seemed to occur around sunset into the night time. 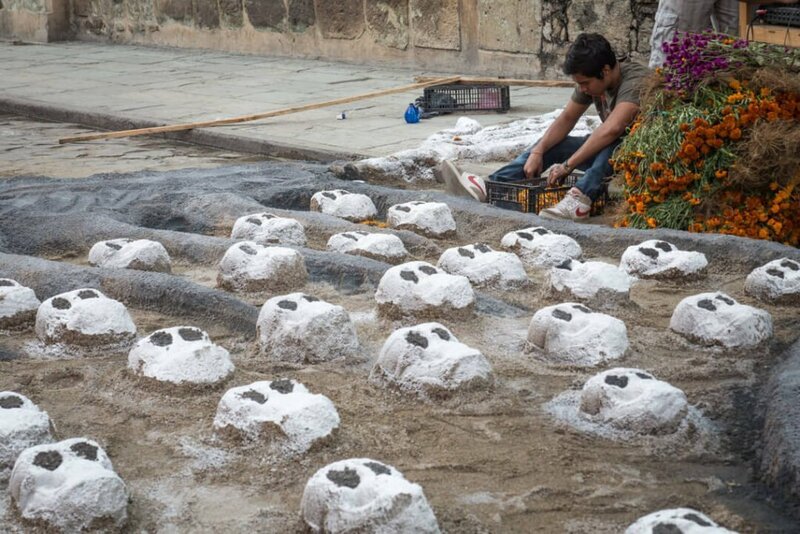 Sand art (tapetes de arena in Spanish) is an integral mortuary custom for the people of Oaxaca. On the South end of Calle Alcalá, just before the Zocalo, giant sand tapestries are built on the street by local artists, depicting Day of the Dead themes. Ladders enable tourists to take good photos and boxes are put out for people to make donations to the artist. There is also a gigantic sand tapestry set up in the Palacio de Gobierno (now the Museo del Palacio) during the Days of the Dead that is worth going to see. Intricate and detailed, these beautiful ofrendas are often a work of art. It is believed that if the family forgets their loved one, and stops building them an altar, the spirit of that person will die a second time, and never again get a chance to come back to the land of the living. I heard it said we die two times. Traditionally a very private affair, the Dia de Los Muertos altars are usually kept inside the homes of the loved ones. Luckily for you, in Oaxaca, there are many altars placed on display not just in people’s houses, but everywhere! In the streets, inside halls and buildings and even restaurants. Simply wander the streets and look out for the incredible displays. Places known to have public altars set up are Escuela de Bellas Artes, across from La Soledad church, and the Casa de la Cultura. Streetside stands are set up to paint the faces of anyone – young, old, local and tourist for a small fee. Get your face painted, stroll the streets and get amongst the happenings. 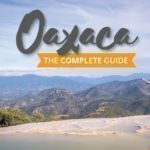 Oaxaca is an extremely important cultural area of Mexico and there are loads of other non-Day of the Dead activities you can do here. There are two ruins which are completely different but equally as awesome as other temples you would have seen in Mexico. There is Hierve El Agua, an incredibly beautiful petrified waterfall. There are tours to Mezcal distilleries and villages famous for making arts and potteries. 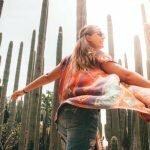 There are so many amazing things to do in Oaxaca you’d be severely missing out if you didn’t spend at least a week here. 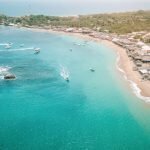 For more information on these activities and other things to do in Oaxaca check out the Full Guide. 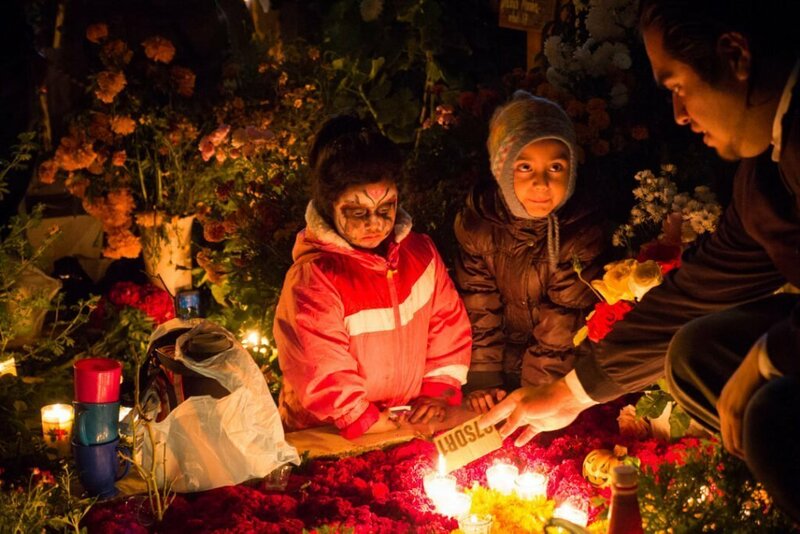 In Mexico, generally, the nights spent in the cemeteries are dedicated to children on the 1st November and adults on the 2nd November. Here, I have compiled a list of events for Day of the Dead in Oaxaca specifying which nights are best to do what activity. AM: Visit the Central de Abastos Market and buy Pan de Muerte and other snacks for later. This is also a cheap place to buy any trinkets you might like. Afternoon: Walk up Calle Alcalá and check out all the sand sculptures. Veer down some side streets to see as many altars as you can find. Around sunset, there will be loads of parades around Centro. From 10 PM: This is the best day to visit Xoxo. Head to Panteon Xoxocotlan for the night, with rum and snacks to share. There will be dancing and singing and although a private affair, there will be loads of people around; local and tourists, who will enjoy chatting and hanging out with you. AM: Eat some food at Mercado 20 de Noviembre. Afternoon: Have a siesta or wander the streets in search of parades and altars. From 10 PM: Visit San Agustin Etla for a political-themed Day of the Dead, or Panteon General if you don’t feel like travelling too far. You could also just party in a bar in the city, get your face painted and dress up, watch parades and get amongst it. AM: Wake up late (as I’m sure you’ll have a hangover by now). Afternoon: Visit Panteon General to see families decorating and cleaning the gravestones during the day. PM: This is the best day to visit Panteon General, as this is their biggest night. It is also a great night to visit the cemetery of San Felipe del Agua if you prefer a smaller, more intimate and less-touristy experience to cap off your adventures. 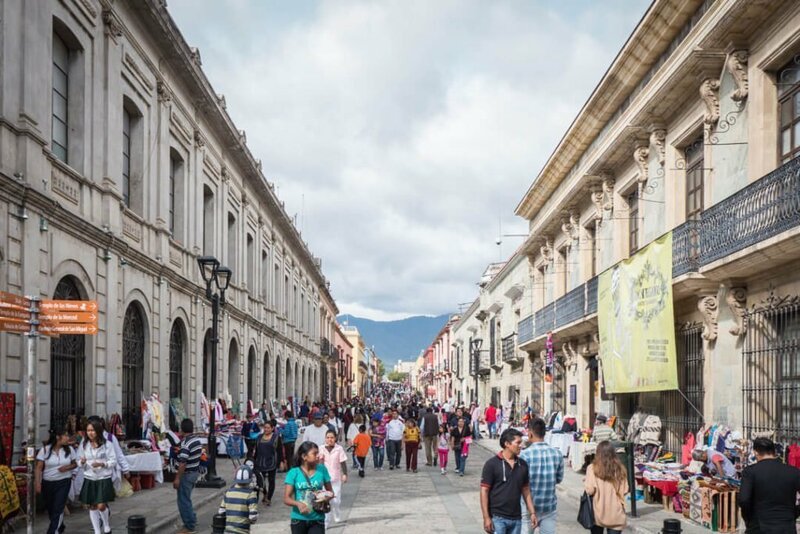 There are parades and lots of random events around the Zocalo, up Calle Alcalá and outside of the Santo Domingo church every evening from just before sunset onwards. Bars are open all day and many people will be drinking, dressing up and getting their faces painted. Also known as Panteon San Miguel. 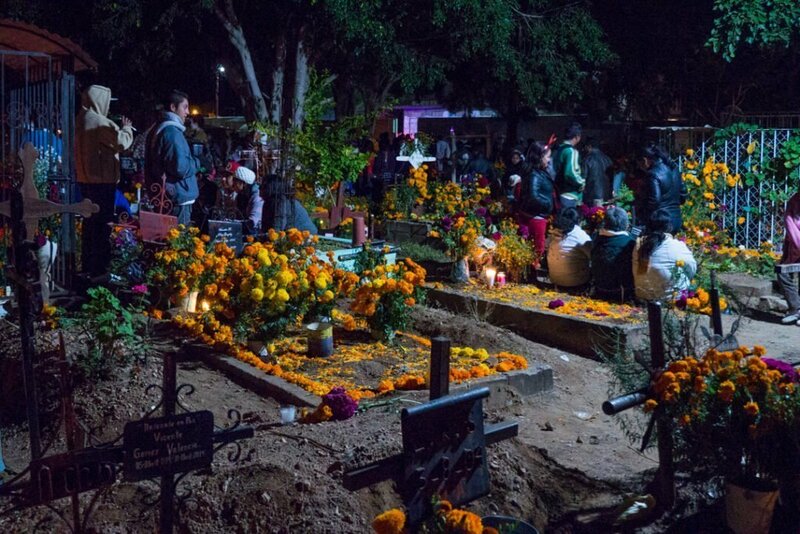 This busy graveyard will have family members, bands and visitors every night of Dia de los Muertos. Or visit during the day to see the decorations in the daylight. 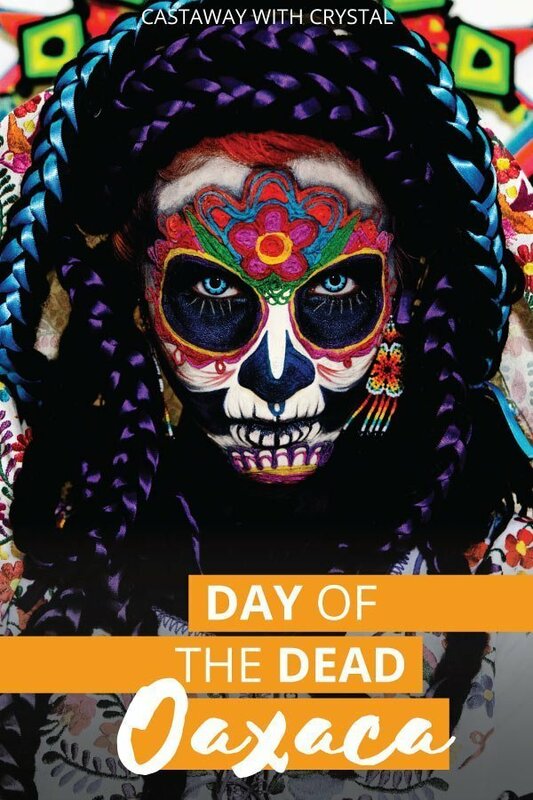 I can’t stress this point enough – you MUST book accommodation early for Day of the Dead. It is an extremely popular destination at this time of year and the hotels fill up months in advance. I went to Oaxaca last minute for Dias de los Muertos one year and did not book anything (because nothing was available) and just decided to wing it. It sucked. 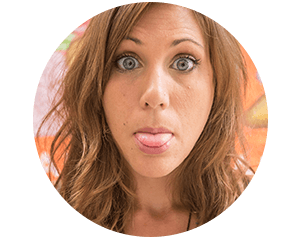 I spent a whole day just walking around to hotels door-to-door asking about availabilities until I found one with a bed free. It was scummy and just absolutely filled with people. Our beds all touched and pretty much just became one giant bed because they put more in there than they had room for (so I was pretty much sleeping with strangers). I don’t think I got any actual sleep anyway because everyone was so drunk and loud the entire time and there was absolutely nowhere to escape to. Do not let this happen to you. 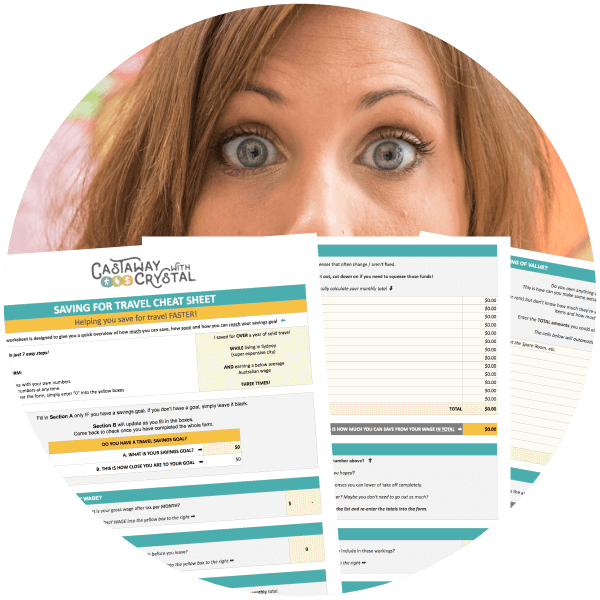 If you’ve left it to the last minute (uh-oh) then Booking.com is going to be your best bet. 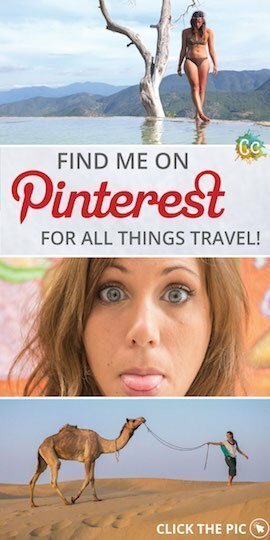 They have a huge database of hotels, hostels and other types of accommodation including ones I’ve seen on Airbnb. The search box below is showing current availabilities for the Day of the Dead dates in 2019 (October 31st – November 2nd). If you run your mouse over the dropped pins you can see more information about each hotel and their ratings. 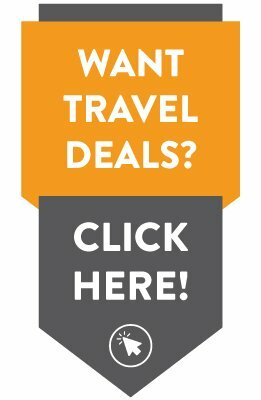 If there’s nothing on Booking.com then you’re really going to be scraping the barrel. 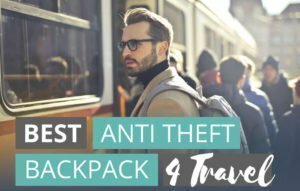 Try TripAdvisor.com and look for hotels that are NOT affiliated with any booking agencies, this will mean they may still have availabilities since you’ll have to email the hotel directly to ask. 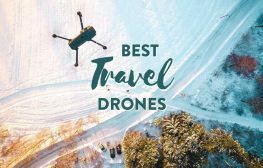 If you’ve been planning this trip for a really long time and are booking nice and early, these are the best hotels in Oaxaca. 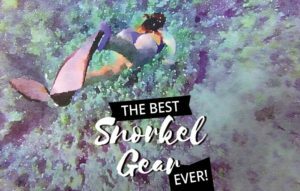 If you book one of these – you’ll have a fantastic time! This exquisite hotel is only a 5-minute walk to the famous Santo Domingo church and a 15-minute walk to the Zocalo in the center of the city. It has a pretty and relaxing shaded terrace area and the ground level rooms even have a private garden. The décor is beautiful and clean and the staff is friendly. This is a very well presented hotel and I thoroughly enjoyed my stay there. The only downside for me was the bed and pillows were a little bit hard. 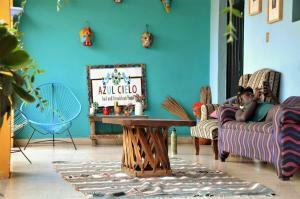 Azul Cielo is a bright, fun and happening hostel and is one of Oaxaca City’s best selling hostels. Azul Cielo is Casa Style with a nice grassy area in the middle of the hotel where everyone hangs out and gets to know eachother. It is one of those hostels that you will always remember. The staff are remarkable, the place is kept clean and the breakfast is amazing! 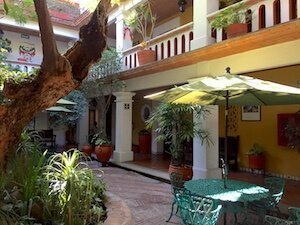 This quaint, clean hostel is located right in the heart of Oaxaca City. It is another Casa Style hostel with a cute little garden square right in the middle of it. 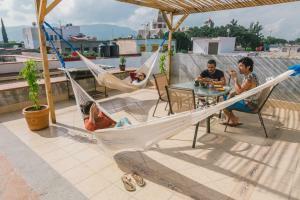 Hostal Chocolate has a nice rooftop to hang out on and a really good free breakfast. I had been obsessed with experiencing Day of the Dead for myself since I did a drama project on it at University in Australia. For me, this festival is the pinnacle of a culture very different to my own. I realised how special their way of dealing with death is when attending for the first time in November. 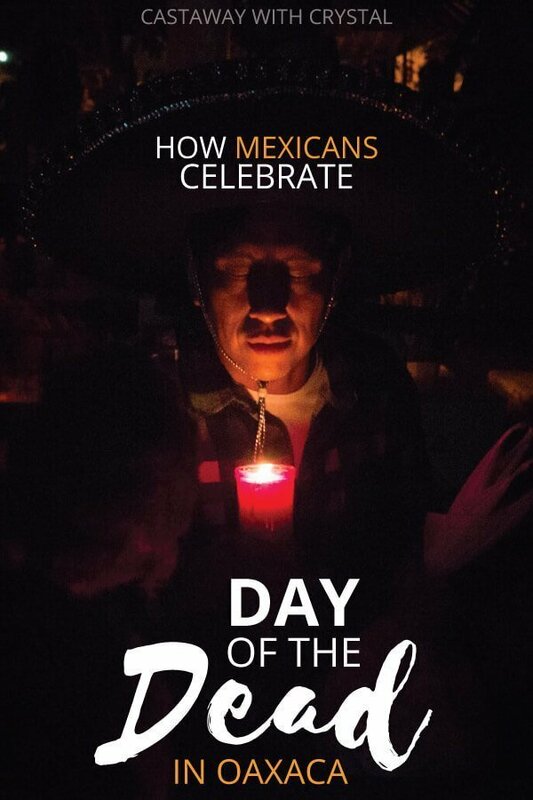 Instead of mourning, the Mexican people celebrate with their loved ones past. In 2015, I lost my mum to cancer and this year I will celebrate her life during Day of the Dead in San Miguel de Allende. For me, it is such a lovely way of dealing with loss and I wish and hope that when I die, I can die like a Mexican. 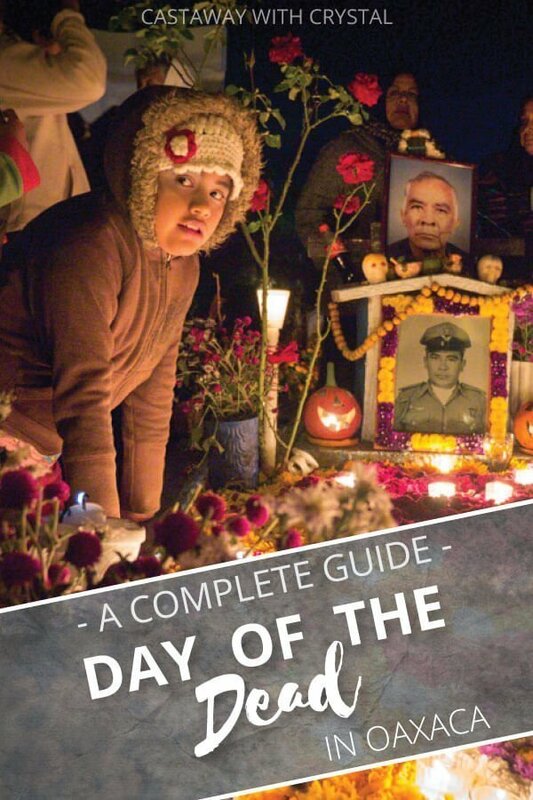 Includes some poignant footage of Day of the Dead in Oaxaca. 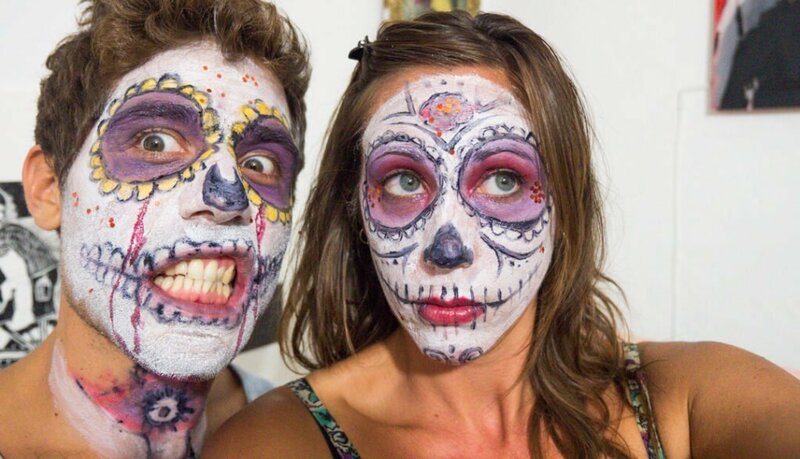 Have you ever experienced Dia de los Muertos? Tell me about it in the comments below! I love everything about this tradition (albeit a darker one), but everything from the music and makeup and elaborate honoring would be so amazing to witness! Instead of being spooky, the candles and people bring such beauty to it. Love this! Was in Oaxaca, Mexico last year and celebrated, such a cool experience! Interesting! Loved the way you have captured the celebrations. Especially, the picture of the couple in wedding dress. Definitely a different cultural experience. Looks like a pretty elaborate set up too. This is very poignant and touching. The pictures capture the respectful, somber and at the same time loving atmosphere very well. I’ve always loved halloween so have always been fascinated with the day of the dead. Would love to go to Mexico one year to experience it. Awesome pics! Oh my your photos are so cool! I’ve always wanted to go see Dia de los Muertos and this makes me want to go even more. In many ways I think its cooler than Halloween! I used to have friends who would travel to Oaxaca just for this celebration, they loved it! Now I can see why after seeing your pics, looks like fun! Love the photo of the man in his sombrero! Amazing post! I love the Mexican belief of death and their celebration of La Dia de Los Muertos is a huge part of that! 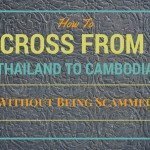 I hope to be able to experience it myself soon and will definitely keep this guide in mind for that. Thanks Juli! I hope you get to go soooon! Great post. Really want to go to Day of the Dead in Mexico. 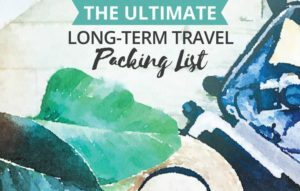 Great tips and places to stay. And Oaxaca is a fantastic place.